To me, while running on pavement, the Shape-ups shoe felt bulky and weird. The extreme half-moon of a sole puts copious padding underfoot — land with a solid midfoot stride and it feels like a Nerf ball got into your sock. Perhaps you’re a fore-foot runner who lands almost on your toes? 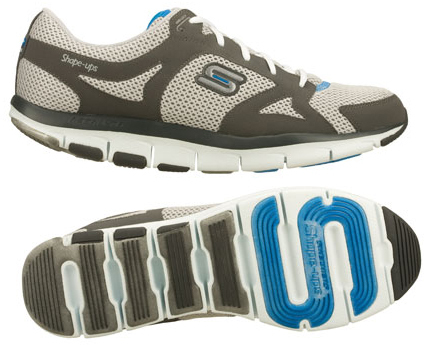 Look out, you’ll trip forward nearly onto your face with Skechers’ shoe-ramp propelling each stride. Granted, the Shape-ups line was likely not made with serious runners in mind. It is advertised as a “toning sneaker,” remember? (I have no idea what that means, by the way.) But even for casual or newbie runners I am not sure the Shape-ups’ rolling platform is a good idea. 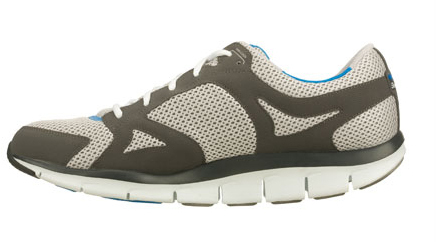 With a heel-stride gait, the shoe does actually run fine. There is some serious heel-to-toe roll going on, and people who jog with this kind of technique might love the Shape-ups design. To the shoes’ further credit, they are pretty lightweight. A test pair in size 12.5 here weighs about 11 ounces per shoe, which is lighter than average though not “ultra-lightweight” as Skechers advertises. I ran three or four times in the men’s Shape-ups Liv, and the shoe was not fun. The company hammers that the Liv promotes a “natural stride” and a barefoot-like gait, but I found the exact opposite to be true. Our second tester, a veteran runner, noted after a 10-mile run that the shoes seemed unstable and felt “puffy” as he ran. Whacky promises like a “nearly limitless range of free motion” and the promotion of body “fluid transitions as you walk, jog or run” further diminished my respect of these shoes and the promoters. Skechers should just say it like it is — the Shape-ups shoes offer a rolling, lazy gait for joggers who land on their heels and want padding and “support” as they run slowly and steadily down the lane.